Upgrade the old flooring throughout your home with versatile and stylish ceramic tile from our store. When you are ready to replace your home floors, let us help you find the right type of flooring for your household so your project is not delayed. If you are interested in floors with the perfect balance of aesthetic value and practical performance, consider ceramic floor tiles. 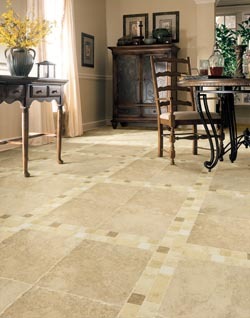 Our flooring store offers a wide selection of attractive ceramic floor options. With the help of our knowledgeable flooring associates, you are sure to find what you need to obtain the floors of your dreams. Extraordinary versatility: Can be used on countertops, backsplashes, walls, floors and more. Unmatched strength: Extremely tough and resilient so it looks great even after continued daily wear. Ease of maintenance: Regular cleaning is easy and fast with a mop and household cleaning solution. Unmatched value: One of the most affordable flooring options currently on the market. In addition to the customer service we provide in the store, our team also delivers exceptional service in the home. With a number of experienced technicians on staff, our store provides affordable and professional ceramic tile flooring installation. Our seasoned installers remain updated on the latest installation techniques, allowing them to complete every project in a timely manner. From proper placement, to even grout, and thorough sealant, customers depend on our experts for the highest level of workmanship. They always work quickly so you can start walking on your new tile floors right away. Since our inception, the satisfaction of clients has remained our first priority. This is why we back our products and services with the Ultimate Confidence Guarantee. The guarantee is a unique promise we implement after you make a purchase. If you are unsatisfied with any aspect of your new ceramic tile flooring, we promise to replace it with a comparable product free of charge. All you have to do is consult us within 30 days of the initial install, and we’ll handle the rest. Contact us to learn more about our financing options, today! We are proud to provide installations for customers throughout Lafayette, Carencro, Youngsville, Broussard, and Scott, LA, plus all of the surrounding areas.